A gold watch is the epitome of luxury. For thousands of years, this precious metal has been a symbol of permanence and wealth. Most gold watches are elegant dress watches, though some have a sportier design. When gold comes to mind, people most often think of yellow gold. However, many types of gold are used in the watch industry, such as white, pink, and red gold . There are also in-house alloys made by manufacturers like Omega's Sedna gold and Rolex's Everose, both red gold alloys. 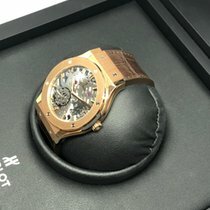 A unique alloy is Hublot's Magic Gold, which combines yellow gold and ceramic, making it extremely scratch resistant. Technically, a timepiece can only be considered a gold watch if the case is made of solid gold . However, you can count watches in a lower price range as well, as their cases are made of stainless steel which is then coated in gold. A gold watch is almost always produced from an metal alloy. Pure gold, which you find in the form of coins or bars available for purchase, is used to plate the surfaces of cases made of a different material. As it's relatively soft, some manufacturers mix it with other metals in-house in order to make it harder and more scratch resistant or to give it another hue. A value of one karat means that the material is composed of 1/24th gold. Pure gold is thus 24 karat. Watch cases with the highest percentage of gold are 18-karat cases , a value equal to 750 gold. The 750 represents the percentage of pure gold out of 1,000. In a 750 alloy, 75% of the material is pure gold, while the rest consists of other metals. Silver and copper are mixed together with yellow gold. The amount varies, however, in order to slightly change the tone of the yellow gold. Red and pink gold have a much larger percentage of copper than silver, which gives the gold its reddish-pinkish hue. White gold, on the other hand, has more silver than copper. Particularly valuable 18-karat white gold watches are made with an alloy containing platinum or palladium. Cases made of 14-karat gold (585 gold) can also be found, although most manufacturers offer 18-karat gold watches today. This applies to watches in both mid and upper price ranges, such as those from Longines, Maurice Lacroix, and Tissot. Some manufacturers use gold-colored coatings that resemble gold, but are actually something else entirely. The most common of these methods uses a PVD (physical vapor deposition) coating. During this process, the coating is applied via vacuum deposition. PVD coatings can also be made of gold and are regarded as very scratch resistant. An alternative is electroplating gold on stainless steel cases. The gold layer is very thin; 20 microns is the norm. One micron is 1/1,000th of a millimeter. The gold plating is either 18 or 24-karat gold and prone to scratches, but can be redone if necessary. The PVD method has grown in popularity in recent years, so you will most frequently encounter electroplated watches in the vintage market. 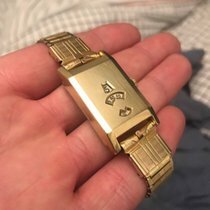 If you want to buy a gold watch, then you should pay attention to the karats. An 18-karat gold watch is an 18-karat gold watch, regardless of the manufacturer. The price difference between gold and stainless steel versions of the same watch can be quite considerable. 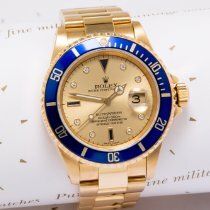 A stainless steel Rolex Submariner with a date display costs about 7,000 euros new, while a yellow gold version in the same condition costs 21,000 euros. The price and value of an 18-karat gold watch also depends on the price of gold. The market price varies, but has usually been over $1,000 for one troy ounce (31 grams) of gold over the last few years. In the summer of 2011, it shot up to around $1,900. It is unlikely that the price will drop below $1,000. The price of gold watches has gone up simply due to their material worth. In the 1990s, the price was still oscillating between $300 and $400. Since gold also functions as a replacement currency in crisis situations, gold watches are a relatively secure investment. In the worst case, the watch retains value based on the weight of its gold. For this to be the case, however, one should imagine that times are tough and the gold price is thus very high. 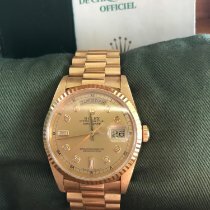 Normally, the collector's value and the manufacturer's reputation play a deciding role in determining the price of a timepiece. Gold watches from an independent manufacturer powered by in-house calibers cost the most. Rolex's Submariner isn't the only expensive gold watch they offer. Other series have gold models, such as the Daytona or the Day-Date. The Day-Date is offered with a white gold, yellow gold, or Everose alloy, and the cases are available in many different sizes. The story is similar with Omega. Their diving watch Seamaster is available in 18-karat gold, and the company offers a large selection of gold watches in their De Ville collection. Patek Philippe is the ultimate manufacturer of gold watches. No other renowned Swiss manufacturer relies so much on the precious metal like the Genevan family business. 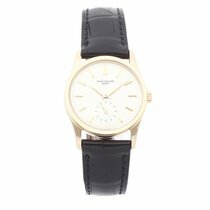 The Calatrava is Patek Philippe's most classic series. Patek Philippe is one of the few manufacturers who doesn't only make the case out of gold, but important parts of the movement as well. A good example is the rotor of an automatic movement, which is often decorated with engravings. Rolex also uses white gold indices - even on the models with a stainless steel case. Not just for aesthetic reasons, either: Gold doesn't tarnish. 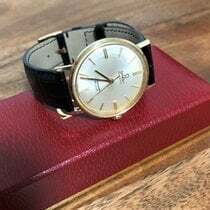 According to tradition, the first solid gold wristwatch was made by Girad-Perregaux and was delivered to the German Emperor William I in 1879. Now, around 500,000 gold watches are produced each year, with 90% of them being made in Switzerland. Rolex plays a prominent role in this, as they alone produce 200,000 of these gold watches. In one year, Rolex produces around 800,000 watches, making gold watches a quarter of their total production. The company produces cases in their own foundry. Gold plays an even more important role for the luxury manufacturer Patek Philippe, however. 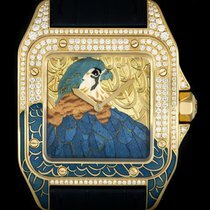 Gold watches dominate Patek's portfolio; there are only a few stainless steel models available. Usually, it's the other way around. Gold remains an expensive exception for most companies. A popular compromise is to create a bicolor watch, where parts of the case and bracelet are made of stainless steel and others of gold. Rolex calls this Rolesor.